"Caye Caulker has a lot to offer the casual visitor. The surrounding clear, warm water and rich, fascinating coral reef attract visitors from around the world. However, not all of Caye Caulker’s treasures are in the water. Although Caye Caulker is a small island, it is blessed with over 100 species of resident and migratory birds. "Several different habitats are represented on Caye Caulker: the sea, seashore, mangroves, littoral forest, and residential properties with their coconuts and other plants. Fringing red mangroves surround the caye, except where cleared in residential areas. Red, black and white mangroves grow in the caye’s wetlands. Littoral forest is found on higher land and includes such trees as gumbolimbo, short-leaf fig, zericote, and poisonwood. . . . "The 105-acre Caye Caulker Forest Reserve at the north end of the Caye is an excellent place for birding. The Forest and Marine Reserves Association of Caye Caulker (FAMRACC) is co-managing it with the Government of Belize. Inquire with local guides about tours in that area. "The Caye Caulker Branch of the Belize Tourism Industry Association (CCBTIA) manages the private CCBTIA Mini-Reserve next to the Airstrip. This 1.5-acre preserves the natural flora and fauna of the littoral forest, which provides habitat for many birds. Guided tours are available. "Another excellent place for birding is the south end of the island, the center of which is the six-acre Caye Caulker Conservancy. There are no trails into this private reserve, although guided tours are available. "A path leads south from the village along the shoreline, through mangrove and littoral forest, and around the south end of the caye. It then turns north, crosses over a bridge, continues through a development, and stops near the airstrip. To return to the village, one must backtrack along the same path since it is forbidden to walk on the Airstrip. In the village, whether walking along the streets or the shoreline, there are many opportunities to see the birds of Caye Caulker." Seventy-five of the birds most commonly seen in Caye Caulker are described in detail with field marks that distinguish similar species and comments on where these birds are seen. 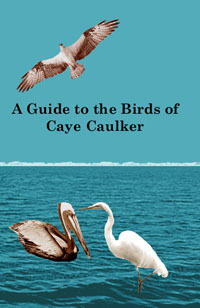 Also included is a checklist of all the birds reported on Caye Caulker.